John has most recently been seen playing Malcolm Merlyn in the hit series Arrow on The CW Network in the USA and Sky 1 in the UK. 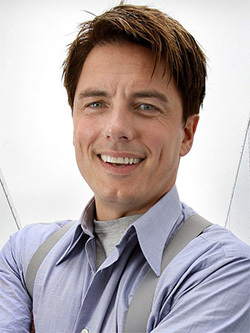 Having created the role of Captain Jack Harkness in the first series of Russell T Davies’s revamped Doctor Who for BBC TV, the character created such an impact that he was given his own spin off series, Torchwood. Series 4 aired on BBC1 and in the USA on the Starz Network as a co-production between BBC Worldwide and Starz Entertainment. John's multi talents were seen on primetime Saturday night in the UK, presenting his own entertainment show Tonight's the Night on BBC1. The show, which helped ordinary people to fulfill their performing dreams, was a co production with John's production company, Barrowman Barker Productions. Three series have aired in the UK, and the format has been sold worldwide, with the show now playing in countries as diverse as Sweden and China. John appeared in season 6 of the hit US TV show Desperate Housewives in the guest role of Patrick Logan and last year he filmed the ABC pilot Gilded Lilys. He was a regular on American television, playing Peter Williams in the Aaron Spelling series Titans for NBC and starred in Darren Star’s Central Park West for CBS. Other UK TV drama roles include guest appearances in Hustle, Hotel Babylon, and My Family. He has previously been a judge on the award winning talent shows for BBC1: How Do You Solve A Problem Like Maria? Any Dream Will Do, and I'd Do Anything. He hosted the family game show The Kids Are All Right on BBC1 and hosts the children's show Animals at Work. He was a celebrity contestant on the first series of ITV's Dancing On Ice, was the subject of a BBC1 documentary entitled The Making of Me, investigating the science of homosexuality and traveled across the USA for Children in Need in Around the World in 80 Days for BBC1. He won the 2010 Strictly Come Dancing Christmas Special and most recently has been guest hosting the daily chat show Attack of the Show for the US cable network G4 and he guest hosted The Brit List for BBC America. John started his career as a leading man in musical theatre, with numerous credits on both London's West End and Broadway. He has subsequently recorded four solo albums with Sony Music, the latest The Very Best of John Barrowman reaching number 12 in the charts. In 2008 his autobiography Anything Goes, which he wrote with his sister Carole E. Barrowman, was published by Michael O’Mara Books and reached number 2 in the Sunday Times best seller's list, remaining in the top ten for 13 weeks. A follow up autobiography I Am What I Am was published in 2009. Hollow Earth, the first of a series of children's book, which he has co authored with Carole, was published in 2012 and the second book in the series The Bone Quill was published in 2013. Torchwood: Exodus Code a novel based on the TV series was also published in 2012.